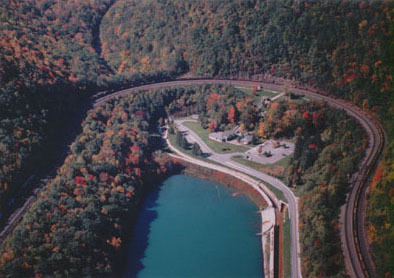 The Horseshoe Curve is located at Kittaning Point, at the base of the Allegheny Mountains and opened on February 15, 1854, engineered by J. Edgar Thompson. The curve's length is 2375 feet; degree of curvature is 9 degrees; central angle is 220 degrees. The elevation of lower (east) end of the curve is 1594 feet, upper (west) end is 1716 feet-122 feet total elevation climb. The grade is 1.8% or 1.8 foot rise per 100 feet. Wagon transportation from Philly to Pitsburgh took about 20 days. In 1834, the same trip via train, canal and the Allegheny Portage Railroad (to cross the mountains) took about 4 days-when the canals were not frozen. By 1852, train could cross the state but still were dependent on the Allegheny Portage Railroad, which didn't operate at night. The addition of Horseshoe Curve in 1854 made passengers travel the entire route by trail, and the time was reduced to an average of 15 hours. The construction of Horseshoe Curve was done by about 450 workers, many of them from Ireland, and the work was done entirely by hand. Workers were paid 25 cents per hour for a twelve hour day. The curve was on the list of 12 key industrial sites targeted by Nazi saboteurs who were captured at tow sites on the US coast in June 1942. Famous people who traveled the curve were: Abraham Lincoln, William McKinley, Theodore Roosevelt, Herbert Hoover, Franklin Roosevelt, Harry Truman, Dwight Eisenhower, Jimmy Carter and dozens of vaudeville stage and screen stars.